Printed and Chipless RFID Market size was USD 2.52 billion in 2015, and is forecast to grow with 26.7% CAGR to surpass USD 16 billion by 2023. Radio frequency identification is employed in the transport sector, where contactless and contact smart cards contribute to the operational efficiency as well as save commute time. The segment will grow at 28% CAGR expectations from 2016 to 2023 to exceed USD 6 billion by 2023. Tangible benefits in inventory control are also likely to augment industry revenue. Remote reading of tags containing unique codes for tracking, as well as simultaneous reading enabling a large volume of products to be checked are among other advantages of this approach. Growing R&D and developments in nanotechnology and conductive inks will present viable growth opportunities to incumbent participants. Need to counter the expanding counterfeit drugs ecosystem is forecast to propel adoption across the pharmaceutical sector. Barriers to revenue mainly included high capital investment. However, low printed and chipless RFID market price trend due to reducing solution cost with the help of technological advancements will drive growth. Concerns regarding privacy and the possibility of sensitive data leak will spur security initiatives in the coming years. Retail applications were responsible for over 29% of the printed and chipless RFID market share in 2015. Growing use in improving the overall customer experience, inventory accuracy, store execution, on-shelf availability, as well as omni-channel retailing will drive growth over the forecast timeframe. The aviation industry contributed over USD 300 million to the printed and chipless RFID market size in 2015. Favorable regulatory landscape is a major growth driver in the healthcare space. Major use cases include patient tracking, surgical instrument track and trace, staff identification, document management, inventory control, etc. The industry has witnessed replacements of chip-based tags with chipless counterparts; these help in avoiding theft through asset tracking and also contribute in preventing counterfeiting. Government initiatives such as e-passports combined with growth in the number of electronic transactions and higher customer satisfaction will positively impact revenue. U.S. printed and chipless RFID market size is forecast to surpass USD 4.8 billion by 2023, at 25% CAGR estimations from 2016 to 2023. Growing demand across application areas is expected to drive growth. Companies operating in the region have been adopting this technology to streamline supply chain management and enhancing inventory visibility. Growing need for document management in government agencies and medical institutions will favor Asia Pacific printed and chipless RFID market growth. The Brazilian government offers incentives schemes to local companies adopting the technology. Companies based in the region have been leveraging it to track and trace their inventory and improve supply chain management. 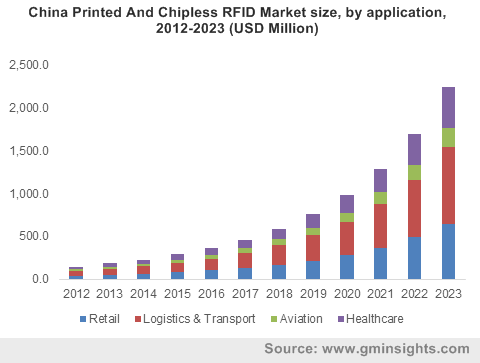 Chip based solutions and barcodes represent external substitutes; however, any rise in demand is predicted to be offset by growing awareness regarding advantages offered by chipless RFID market implementation. Growing popularity is also forecast to attract new companies to enter the industry. Major players include Zebra Technologies, Impinj Corporation, Alien Technology Corporation, TAGSYS RFID, and Intermec. Companies aim at ensuring considerable product differentiation and actionable solutions through R&D and product innovation activities. Focal areas include extensiveness of the product portfolio, quality of the products and services, performance characteristics, availability, etc. Companies accounting for printed and chipless RFID market share also need to ensure effective branding and strong customer relationships to sustain in the competition. In October 2014, Zebra acquired Motorola Solutions’ Enterprise Business, which helped the company gain Motorola’s RFID hardware, mobile computing, card printing, bar coding, and cloud-based devices businesses. In addition to products, Alien Technology also has a strong service portfolio, comprising technical consulting, program and project management, system configuration, training services, etc. Radio frequency identification is used to identify unique items by using radio waves. Conventional systems consist of three primary components readers, antennas, and transponders (tags). Over the years, the technology has been used for various applications such as supply chain management, retail management, manufacturing and processing, access control, security, and location tracking. RFID operates at different frequencies, which depends on the application requirement. Government regulations related to frequency use are important factors to be considered before implementation as the tags may not work if there is a frequency difference. They can be embedded or externally attached to the identifying object, which can be scanned by stationary or mobile readers using radio waves. Active, passive, and semi-passive tags are used for object identification. Readers are scanning devices that read, tag, and forward the result to middleware. They use their own antenna to communicate with the tags using suitable radio waves. They are capable of processing multiple objects simultaneously and can be mobile or stationary based on the application needs. They can be differentiated based on processing, operational frequency, and storage capacity. Middleware is a combination of hardware and software, which connects readers and their data to information systems. It is used to filter data and pass information to enterprise application; additionally, they can also be used to manage readers on the network installed. Operating frequencies include low (LF), high (HF), and ultra high (UHF) types. LF mainly finds application in asset tracking, animal tracking, car immobilizers, and security access. HF products prove useful in smart card operations and access control, while UHF systems have very long reading ranges and are used for applications such as automated toll collection, car tracking, etc.